Russia's continuing intervention in Ukraine, including its annexation of Crimea, is more than a stark rejection of Euro-Atlantic integration. It has shattered the vision of a stable, secure, and economically healthy Europe that has guided North Atlantic Treaty Organization (NATO) and European Union (EU) policy for two decades. NATO, working closely with the EU, needs to regain the initiative to proactively seek peace and stability on the continent and find a coherent, cohesive way forward. In this perspective, we describe two possible strategies for how NATO can respond to Russia's activities: (1) punishment and disengagement and (2) resilience and engagement. NATO's choice of a strategy comes down to whether to promote or give up on an integrated Europe and whether and how to influence Russia's behavior both politically and militarily. Our preference for the second strategy is based on its continued commitment to North Atlantic values and refusal to view Russia in adversarial zero-sum terms. 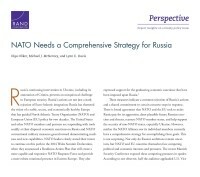 Oliker, Olga, Michael J. McNerney, and Lynn E. Davis, NATO Needs a Comprehensive Strategy for Russia. Santa Monica, CA: RAND Corporation, 2015. https://www.rand.org/pubs/perspectives/PE143.html.